I was fortunate to meet Allan Boardman at IPP32. 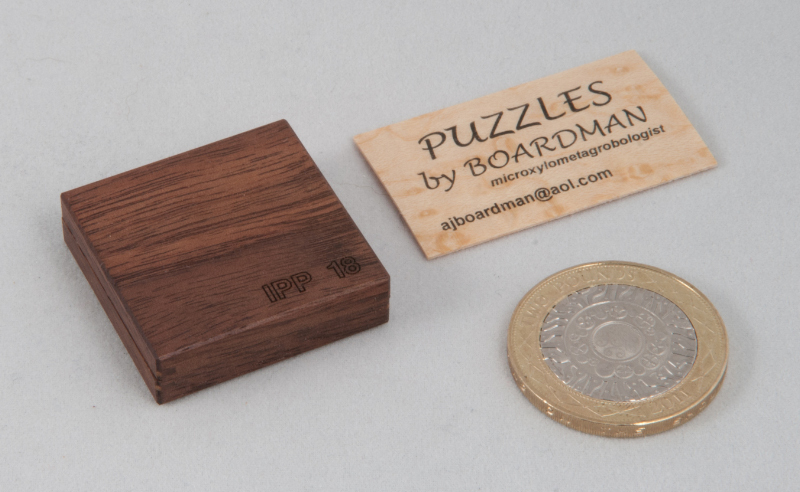 On his tiny 45mm x 25mm business cards, Allan describes himself as a microxylometagrobologist - or a micro wooden puzzler if you prefer – there’s a clue in that the tiny business card is printed on paper thin 2-ply Birdseye Maple. Allan has been making micro wooden puzzles for years and has produced a range of well-known puzzles in minute scale... every serious puzzle collection really needs to have at least one Boardman creation in it ... or that’s my theory (or rather excuse) at least! 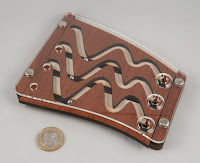 Fifth Avenue was designed by the great Nob Yoshigahara and it consists of a 5x5 tray with a set of 2 dominoes and 7 trominoes (giving you a total of 25 tiles) with various combinations of five woods. 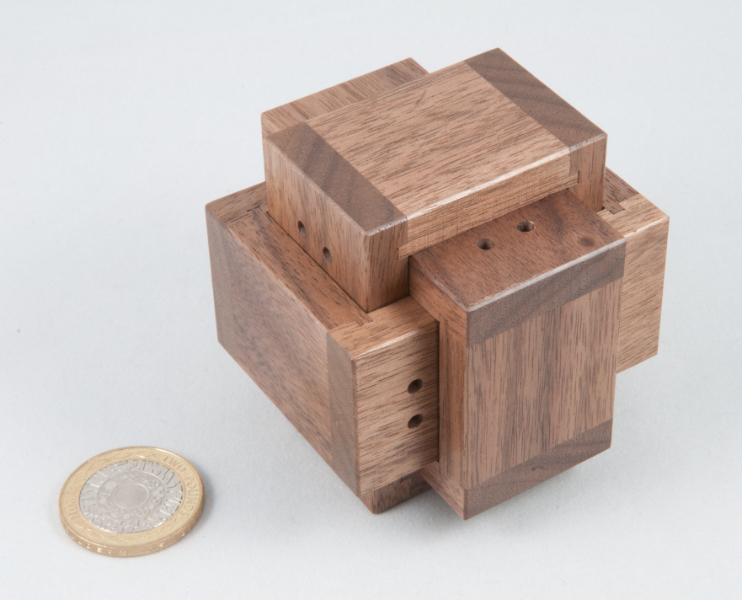 The aim of the puzzle is to pack the pieces into the tray such that each row and each column of the resulting square has each type of wood represented only once. Sort of like a mini Sudoku, in wood ... except that the way that Nob has joined those pieces means there’s a unique solution – ignoring rotations and reflections... which makes it rather non-trivial! Allan’s version – his IPP 18 exchange puzzle version, comes in a walnut box that is a mere 32mm square and the entire box is only 9mm tall ... yet there are slipfeathers on all of the corners, there’s a lip inside the box and a sheet of instructions nestling on top of the pieces inside. The pieces are made up of 5.5mm cubes in five different hardwoods. The craftsmanship at that scale is quite simply staggering. 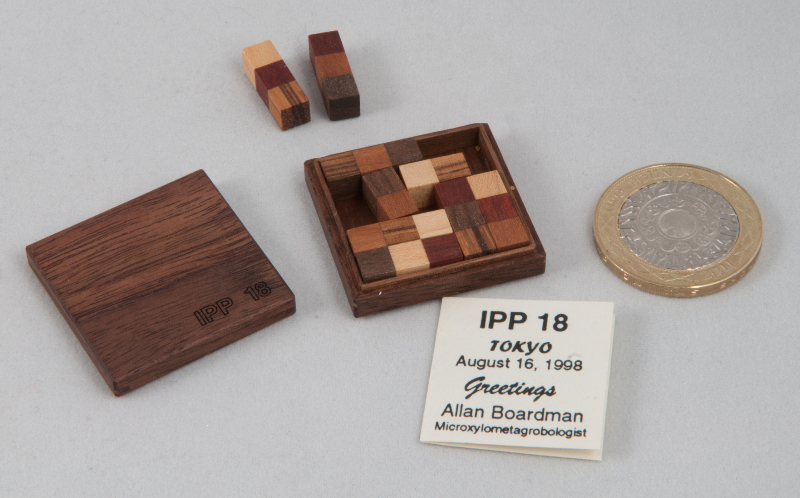 If you’re interested in making a copy of your own, pick up a copy of Allan’s Puzzle Projects for Woodworkers – mercifully the version in the book is 4 times larger than this little guy! As luck would have it, work turned a bit hectic in the run-up to Christmas so I didn’t end up taking any time off around Christmas or New Year. (It’s calmed down now, thanks for asking.) I’d been expecting my traditional Japanese Christmas parcel and then just after Christmas I was in the office when Gill called and said we’d received a ransom demand from Parcelforce ... and they wanted £580 in VAT and fees to release my little package ... which was a bit sickening, not least because I’d only paid about half that for the puzzles! This year I requested presents from Akio Kamei, Tatsuo Miyamata, Hiroshi Iwahara, Hideaki Kawashima and Shiro Tajima, and received all of the craftsmen that I’d hoped for. During the second half of 2012 a couple of Expansion variants appeared on the Karakuri web-site and I was lucky enough to have a play with Expansion III at James Dalgety’s place back in December. It’s a pretty cute mechanism and quite unexpected ... and Expansion IV develops that idea a little further. 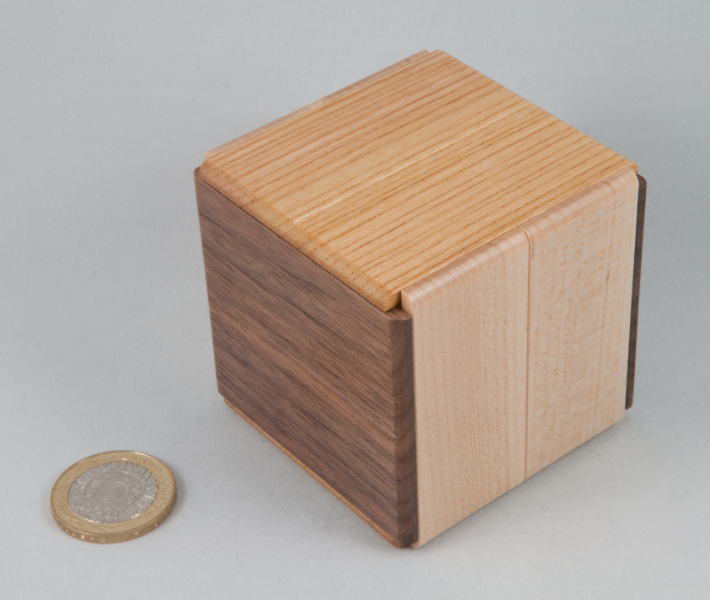 It doesn’t look like your average puzzle box, in fact it looks a bit more like a burr than a box to me. 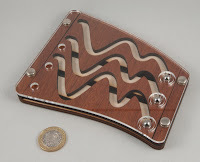 It won’t take a hardened puzzler very long to get into it, but it’s a neat little mechanism and it’s fun to play with. One cute feature is the series of little peepholes on each walnut piece that gives you a view inside of something metallic ... interested yet? After last year’s Water Pump, Sunflower isn’t nearly as difficult a puzzle. Why Sunflower – because his wife loves sunflowers and she had been asking him to incorporate them into a puzzle for a while, and he’d finally found a way to make them an integral part of his puzzle. 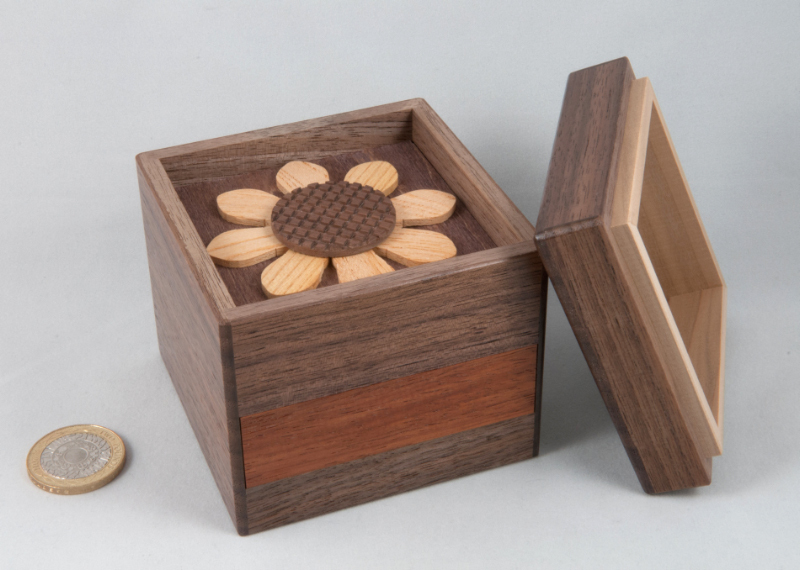 Removing the lid of this handsome little box reveals where the puzzle gets its name from – a neatly crafted little sunflower placed inside the box – apart from a couple of springy panels to fiddle around with, there doesn’t seem to be an awful lot that you can do with the Sunflower box. Once you find the starting move, it should only take a few seconds to open the secret compartment. Not the toughest, but beautifully made! 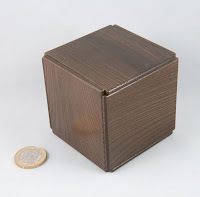 As you might expect from the craftsman behind the Super-Cubi and the King-Cubi, this is a pretty decent little challenge... approach it like a standard puzzle box and you’ll have it open pretty quickly ... and then notice the rather prominent “A” marked on the lid you’ve just opened and on the inside of the box. Hmm. Wonder why that’s there? Take a closer look at the box, that teeny little compartment and the lid, and you’ll soon reach the conclusion that there’s probably another compartment in there somewhere ... and finding that second compartment is a bit trickier than finding the first one... it may be similar in some senses, but it’s definitely trickier to find your way through to the second compartment. 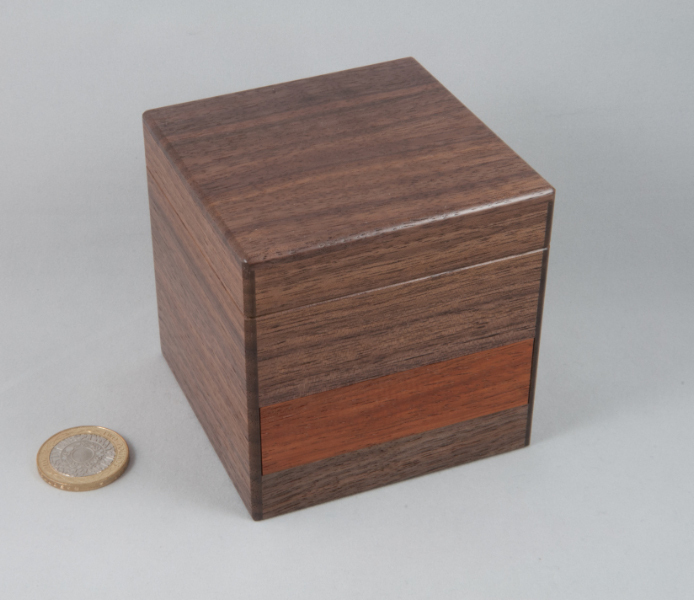 The name – Half Finished Box is definitely a reference to how it’s likely to be left by an unwary puzzler and not a reference to the quality of the craftsmanship on this box – that is tremendous with the shiuri cherry giving a lovely green tinge to the box in the right light. Last year Kawashima’s Christmas present was Twin ... and it was pretty sneaky! This year his write up warns that if you’re used to his Christmas presents, this one might be a bit tougher than usual... ominous! Last year we had a pair of lids opening after a series of moves with several panels split and moving independently ... this year the colour-scheme hints at a different sort of combination of moves, yet the faces have a similar split panel appearance to Twin. Start fiddling with it and you know immediately this is a different sort of beast altogether! Two of the panels move, a little, and then they snap back into position rather sharply, suggesting something intriguing at play inside. 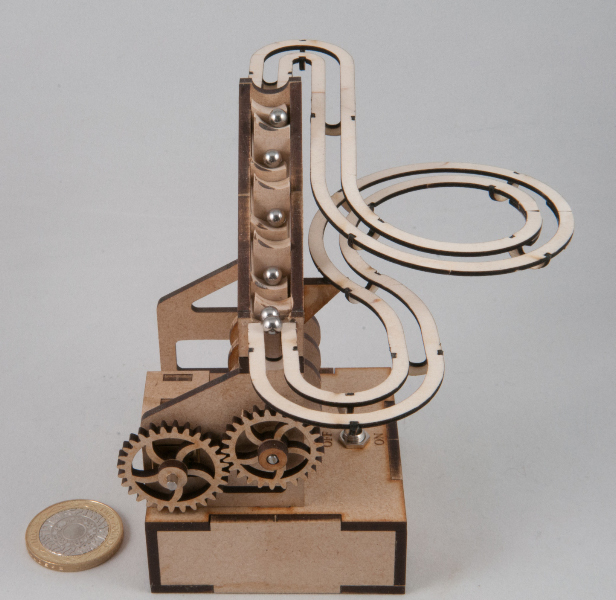 The second move is rather unexpected and somewhat counter-intuitive ... and from there it’s just a hop, skip and a jump to open the two compartments ... very different! Shiro Tajima has been crafting Christmas presents in the form of Chinese Horoscope figures for years now... 2012 was the year of the snake, and he’s chosen to depict the legend of Uroboros in this year’s puzzle. Uroboros appears in a number of mythologies around the world and it depicts a serpent eating its own tail, representing cyclicality and the eternal return. Easily the Karakuri Christmas Present with the most ‘character’ in my haul this year – and making sure that Shiro Tajima has a firm place on my favourite Karakuri craftsmen list. The latest little gem from Hanayama is a puzzle I’ve been wanting to try and get hold of for a while. 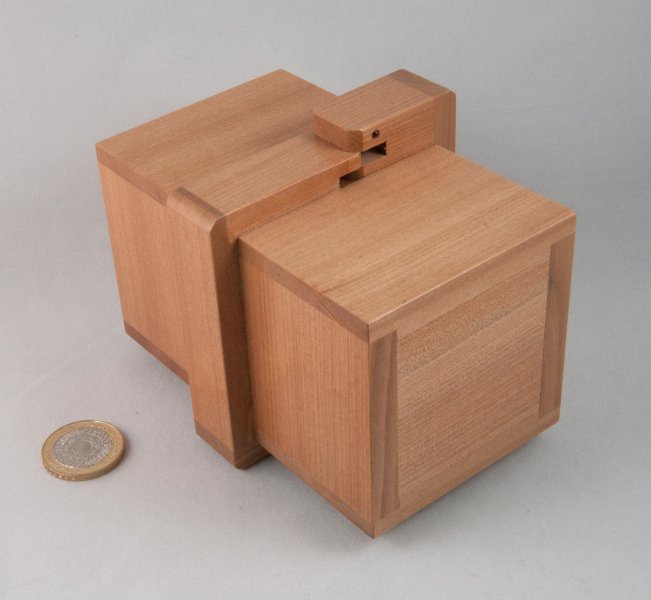 Harmony was entered in the 2010 Nob Yoshigahara Puzzle Design Competition at IPP30 in Osaka where it won the Puzzler’s Award and a Jury First Prize Award! 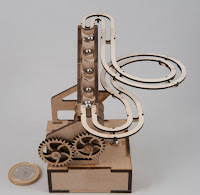 So not only was it the most popular puzzle among all the folks who got to play with it at IPP30, it was also very highly rated by the puzzle-cognoscenti on the jury ... that’s pedigree. The puzzle was designed by Kirill Grebnev and Dmitry Pevnitsky and had been available on Kirill’s web-site since the competition ... but it was being cast by hand and that came at a reasonably stiff price so I’d been holding back for a while ... but when Hanayama came out with their version, I grabbed one right away. My copy came via one of my usual suppliers by the name of Strijbos, who happened to have a pile of them available at Peter Hajek’s End of Year Puzzle Party back in December. 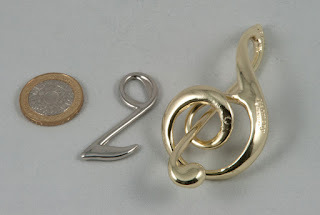 Harmony is a variant of a puzzle called Spiral designed by Kirill a couple of years ago ... and Dmitry’s contribution was to realise that it could be turned into a treble clef with a note hanging off it and I think that the combination is excellent! 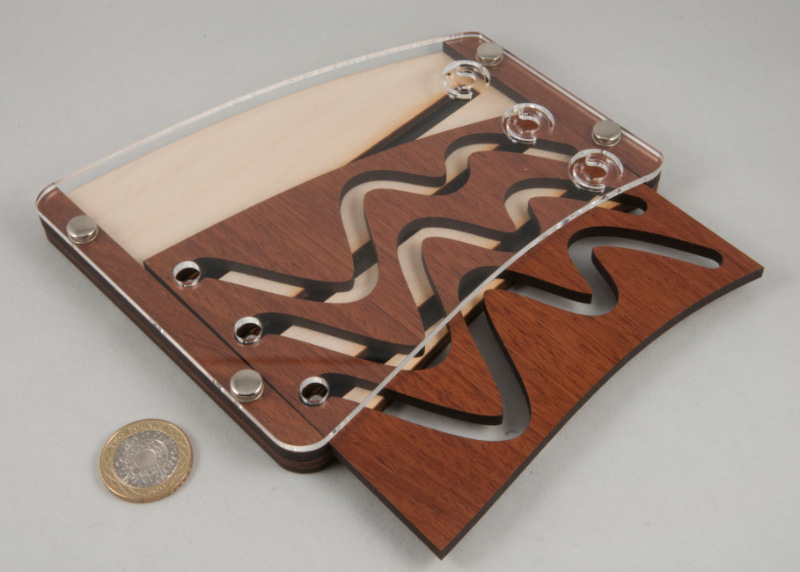 Without the added aesthetics, it would be “just another entanglement” puzzle, with the musical twist, it’s an elegant puzzle that stands out on its own. Topologically they might well be identical ... but that’s where the similarity ends. 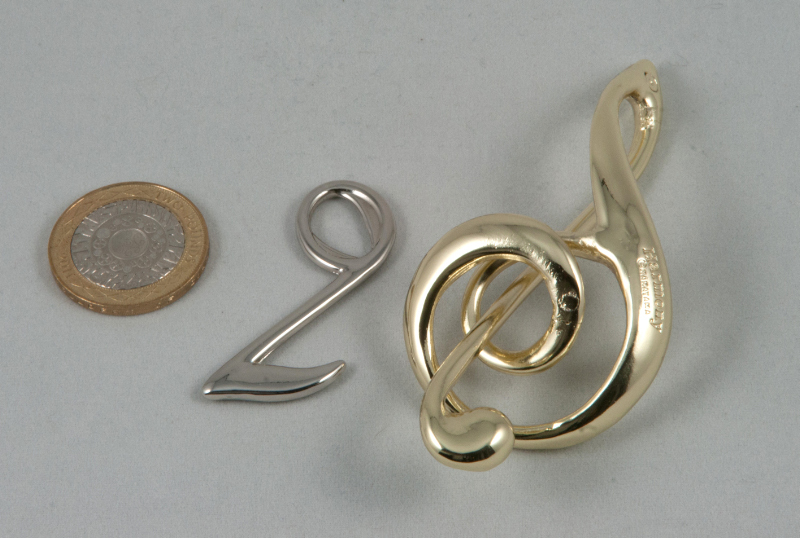 The manufacturing is up to Hanayama’s normal standards so the puzzle elements all work perfectly and it looks excellent. Puzzle-wise, it’s not a particularly difficult challenge. You need to work out whereabouts to start from, and then it’s a case of working out what can go where and what orientation everything needs to be in ... a bit of exploring and you’ll find your way out without too much trouble. There are a few spots along the way where the movements involved are quite delightful – Kirill and Dmitry have done a great job designing this one ... and it’s clear why it was such a popular, and awarded, puzzle at IPP30. After all the abuse I hurled in his direction in the last post, it's only fair that I even out the scales a bit! Back at the start of December Oli's flickr-stream showed a pic of some lovely little leather disentanglement puzzles that he'd made - it's a pretty standard design that's been implemented in hundreds of ways - one of them available from Arteludes if you're interested - but Oli's come up with a really simple, effective way to make them ... then he must have run off a whole bunch of them because he was handing them out to everyone he knew at Peter Hajek's End of Year Puzzle Party a couple of weeks ago - and I scored one! Cheers for that Oli! It's become an instant favourite to show puzzle-muggles. If you want to make one for yourself, all you need is a piece of leather (or something similarly flexible) - put two slits down most of the length and punch a round hole at one end of those parallel slits, roughly the same diameter as the distance between the slits. Slide two buttons onto a piece of twine and tie knot at the two ends trapping the buttons ... then put a drop of glue on each knot to stop "others" from untying the knots ... et voila! 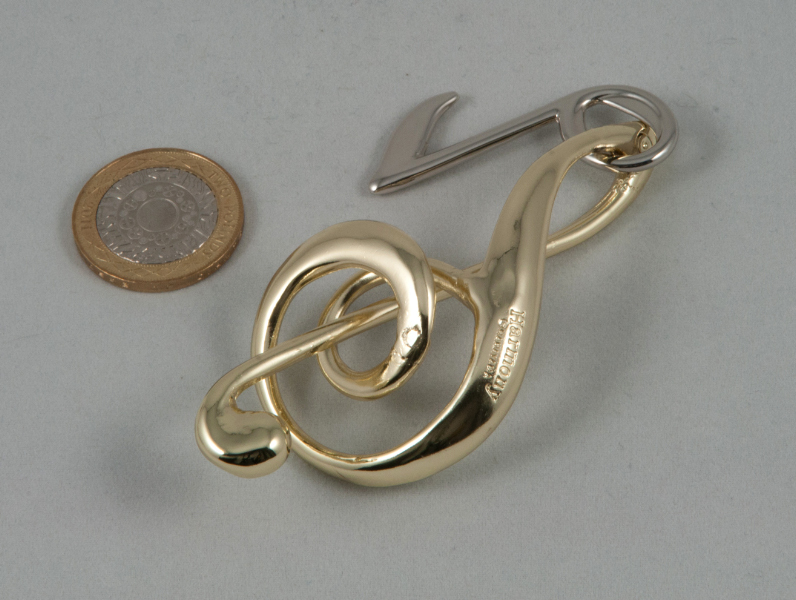 Your very own disentanglement puzzle ... once you entangle it, of course! There’s an unwritten (albeit oft-spoken) rule among the Midlands Puzzle-clan that we all blame Oli ... not just for our puzzle purchases, but mainly that! His blog has encouraged an awful lot of us to spend piles and piles of hard-earned cash on little toys ... feel free to blame him too if that will help your addiction. 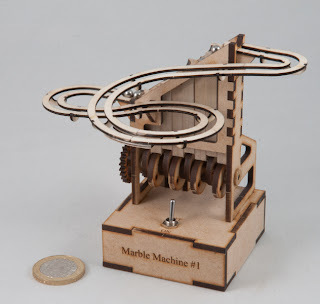 Anyway – in that sort of vein I recently stumbled across a similarly useless contraption that I knew I just had to get – it’s called Marble Machine #1 from an outfit called Busted Bricks. 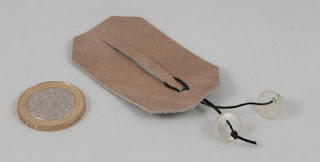 After watching their online videos for a couple of seconds I was on their website ordering a kit... the kit contains everything you need (except the glue – and they’ll sell you some of that too!) 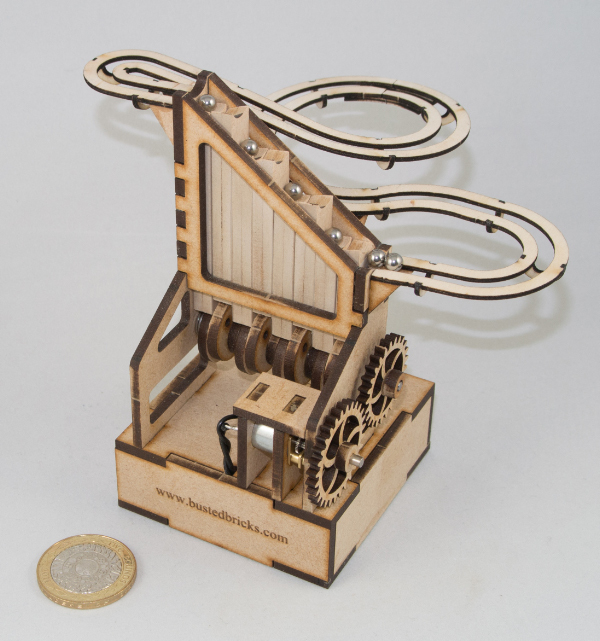 to build a terrific little kinetic sculpture. 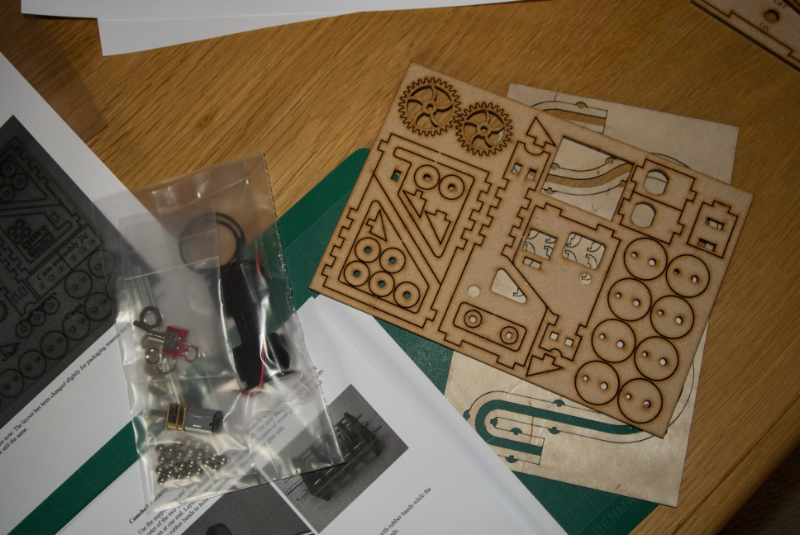 The wooden bits are all perfectly laser cut in thin ply and MDF ... the pieces go together absolutely perfectly and it’s a joy to build. 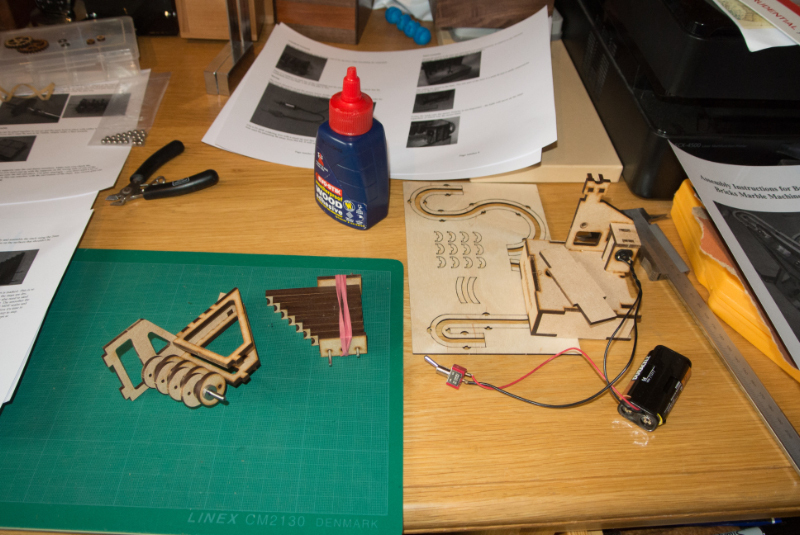 It took me three or four hours on and off over the course of a Saturday – with several breaks in between while various sub assemblies were drying. 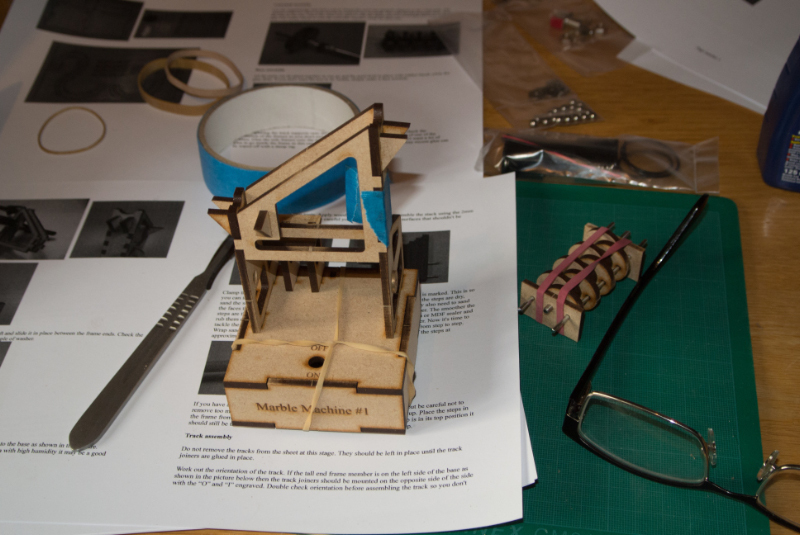 Apart from removing the remnants of the tiny tabs that keep the pieces in their sheets at the start and introducing the slope on the steps, there’s very little sanding to be done – the fit is spot-on everywhere. The design is quite clever and results in a self-jigging assembly process so it’s hard not to end up with everything square and fitting as it should. The electric version has a super little geared motor to drive the lift and the batteries are hidden away inside the base ... or you can opt for the manual version that gives you a crank on the side to drive the lift. 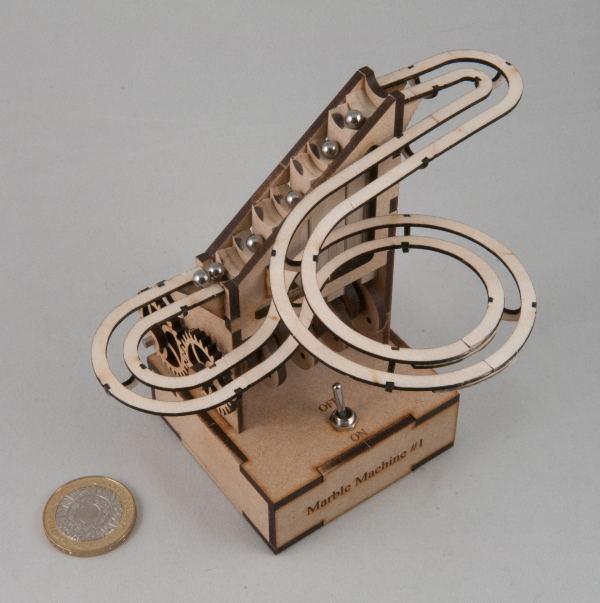 ...a great little thoroughly useless contraption to sit and stare at or run in the background while you’re doing something that requires serious concentration – like puzzling! I’ve been reading Jerry’s puzzle blog since he started writing it back in June 2011. We seem to share a love for similar sorts of puzzles so it’s always a pleasure reading his points of view and thoughts on puzzles that I haven’t come across yet – and for getting another point of view on the ones I have. ...and then a little before Christmas I had a note out of the blue from Jerry asking me for my address so that he could send me one of his new puzzles as a Christmas present, in return for my thoughts on the design – and so it was that a little package arrived from Singapore about ten days later. 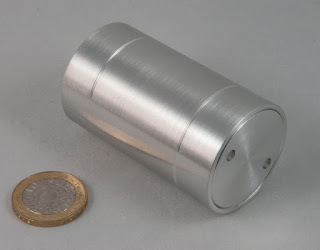 The handsome little brushed aluminium cylinder looks every bit the professionally made puzzle. 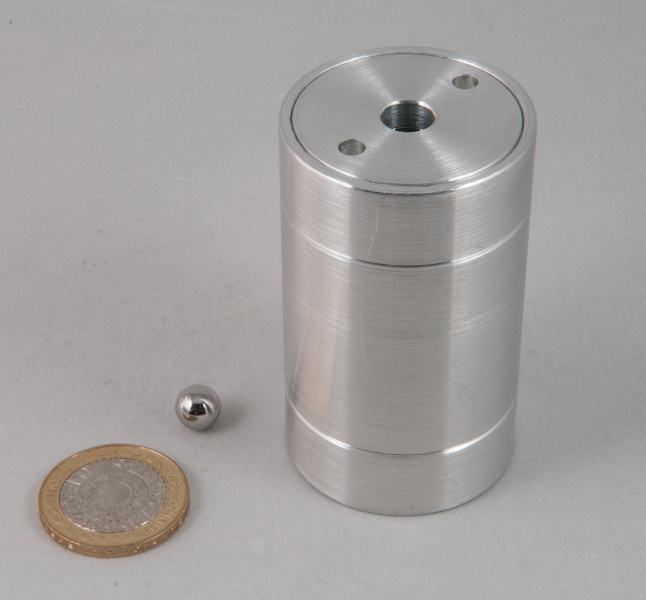 Mine came with a little bit of tape across one end and a little ball bearing in the single hole visible under the tape, and tilting the cylinder back and forth you’ll notice there’s something inside that goes backwards and forwards and bashes up against the taped up ball bearing. Being the cautious sort I dropped Jerry a note and asked if I was allowed to remove the tape – silly question! – Yip, remove the tape and a ball bearing pops out... OK drop it back in again and roll it out – so far so good – I think I understand this thing – repeat the exercise and the ball bearing stays in there... uh oh! 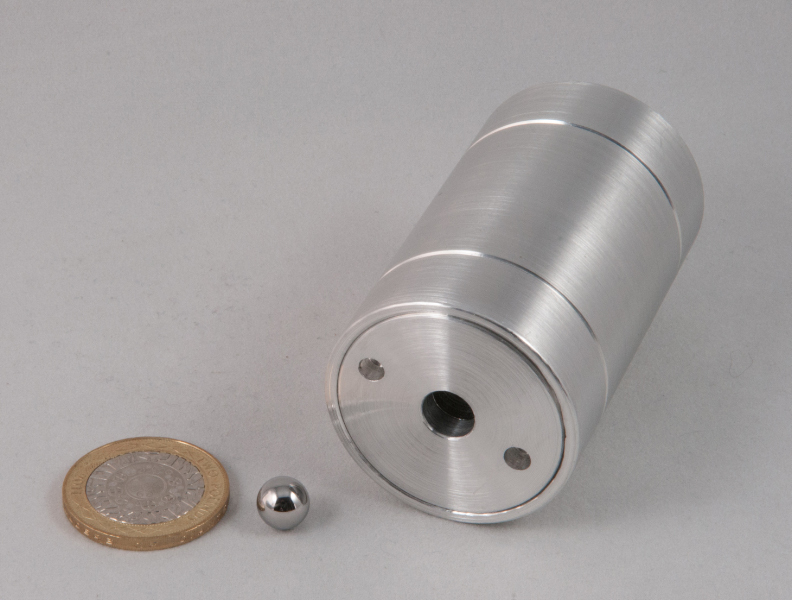 OK, now I’ve locked it ... the ball bearing is inside and tilting it backwards and forwards just rolls something else around ... but hang on there’s a new sound in there now – the sound of a ball bearing running around in circles! Guess where my original ball bearing is now! ...and that’s where it stayed for about half an hour! Not because I’d lost interest, but because I couldn’t get it out! It stayed firmly locked inside there until I had a very close look at the puzzle and then fired up a couple of the little grey cells and a couple more of the senses ... which led me to notice something very subtle ... and about a minute later the ball bearing bounced off the desk and landed on the floor – success! 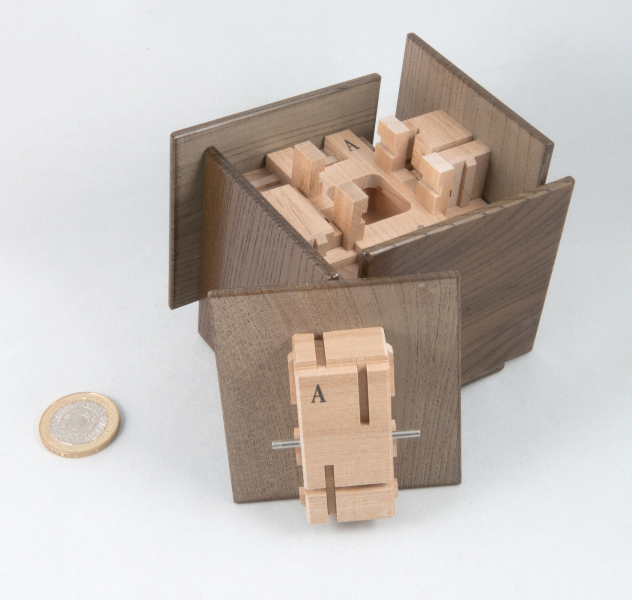 I think it’s an elegantly simple puzzle – nothing is over complicated but it will provide a nice little challenge ... it’s very nicely made and looks the part among all the Strijbos puzzles in the collection (and that’s meant as high praise!). 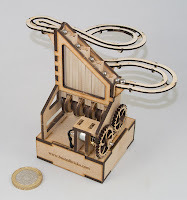 Jerry, if this is only your second puzzle design, I think you’re going to produce some absolute crackers if you decide to carry on designing more in the future ... please do! You can read Kevin’s thoughts on Jerry’s Ball in Cylinder over here and if you’re interested in getting hold of one of them, please contact Jerry via his blog (there’s an email link on his profile page). He’s already mentioned that his initial run of 15 have all gone, but I’m sure if there’s enough interest, he’ll think about getting some more made up... go on and badger him! You’ll enjoy it. Puzzle-wise there are quite a few variations on the Gray Code theme out there. Three adjacent wavy tracks interfere with a sliding panel that allows the ball bearings to progress up and down the tracks … but the implementation is sublime as the balls rise and fall on their own as you move the slider left and right, making the 100-odd moves an absolute pleasure … and once you get all three balls to the bottom, the cherry on the top is that you can remove the balls from the their holes and pop them back in at the top again thanks to the clever little one-way holes at the top of the tracks. Goetz Schwandtner has written an excellent paper on this family of puzzles – including Welle – over here … if you haven’t read it yet, it’s highly recommended! Sometimes the simplest ones are best!